Maryland has the second highest commuting times in the nation and the National Capital Region faces the nation’s worst congestion. 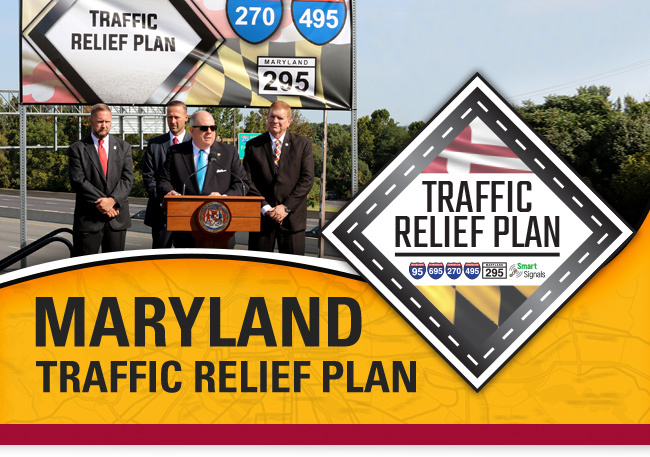 To address this issue, Governor Hogan has initiated an ambitious Traffic Relief Plan to bring innovative solutions to address the transportation challenges on Maryland’s most congested roads, including I-495, I-270, MD 295/The Baltimore Washington Parkway, I-695 and I-95. Once completed, the Traffic Relief Plan will ease congestion, reduce travel times and improve the quality of life for the citizens of Maryland.